As a Child & Adolescent Psychiatrist, I have the privilege of working with many children who are victims of severe abuse, neglect, and trauma. Some, in turn, become perpetrators of violence. As a Child & Adolescent Psychiatrist, I have the privilege of working with many children who are victims of severe abuse, neglect, and trauma. Some, in turn, become perpetrators of violence. One adolescent, lets call him Steven, told me that he wants to be an electrician, but he is struggling to earn his high school diploma, which he needs in order to enroll in technical school. When I inquired about his struggles, he looked down at his feet and whispered, "I'm not sure I have what it takes. What if I try and can't do it?" He went on to say, "When I was little my dad used to say that I was good for nothing. I can still hear his words even though he is gone. I'm not sure I believe in myself. What if I fail?" During the next few moments of silence, I think about Steven's life experience. He repeatedly watched his father beat his mother, feeling not only terrified, but also helpless. Steven was often assaulted himself and secretly wished his father would "just go away" as he cried himself to sleep most nights. His mom passed away when he was 7 years old, leaving him only with his abusive father. At age 13, his father was killed in a horrific accident. Steven was filled with grief and saddled with guilt. His school experience was not much better than his home life. He states that he has never had any friends and that he was often the object of ridicule and bullying. Once the teasing got so intolerable that he almost brought a gun to school to threaten his tormentors. He feels ostracized and believes that no one has been there for him in the past and he doesn't know if anyone will be there for him in the future. Steven and I talked for a bit before he left my office. I thanked him for sharing his thoughts and acknowledged that it must be difficult for him to have his father's words resonate in his ears. I think about how much I genuinely like Steven, who is intelligent and sensitive. I reflect back on my own school days and realize that in some ways Steven and I are alike. I remember aspiring to become a physician. I also remember how utterly distraught I was when I was initially rejected from medical school because of poor Medical College Admission Test (MCAT) scores. As I struggled to figure out exactly what to do, I distinctly remember my fears. Do I have what it takes? What if I don't succeed despite my best efforts? 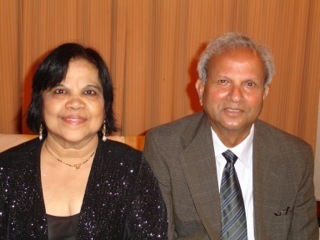 Unlike Steven, I have parents who supported and encouraged my efforts, and they continue to be there for me today (see photo above of my parents Ajita (mom) and Venkatesth (dad) Kamath). One of my earliest memories is of my father saying, "I believe in you. You can do whatever you set your mind to." I wonder how different Steven's life could have been if only someone early on had nurtured and encouraged him. I wonder about the society that we live in and about the thousands of Stevens who have had devastating life experiences. I am reminded of all the questions I have been increasingly asked over the years about youth violence. How do tragedies like Columbine and Sandy Hook occur? Why are there so many school threats? What has happened to America's children? From a public health perspective, I ask, aren't we as a society obligated to see youth violence as a social problem that can be prevented rather than an inevitable fact of life? Although the issues associated with youth violence are complex, we as a society can work towards a solution to this epidemic by supporting the development of healthy families and by promoting healthy communities. For any individual child, we should support his or her social and emotional development. It should be a child's basic right to have someone believe in him or her. As a parent, I look at my own children and hope I am giving them what they need to be resilient, well-rounded, and successful citizens, even as they are young adults. I am continually amazed and sometimes fearful at how much I influence them. When my kids were younger, I distinctly remember attending Back to School Night. My husband and I gazed at the self-portraits that our seven-year-old identical twin daughters had created. Surrounding their pictures, our children had described themselves in words. One wrote that she is "kind and courageous," while her sister noted that she is "honest and caring." My husband immediately turned to me and said, "Hopefully we are doing something right!" I laughed. Parenting is challenging, but we do our best to raise our children. A few years later, I attended Steven's graduation. I was tearful as he gave his graduation speech. He spoke of how proud he was that he was able to earn his diploma and how he had persevered through so many obstacles. After the ceremony, I congratulated him. With an enormous smile on his face, he inquired, "Dr. Braver, did you think I could do it?" I was beaming too, as I told him, "I believe in you. You can do whatever you set your mind to." Vanita Braver, MD is a mom, a Child & Adolescent Psychiatrist, children's book author of the "Teach Your Children Well" series (see www.drvanitabraver.com) & Ellen DeGeneres fan.